I’m here to present you with a dish that kept me company in the final week of my first clinical rotation—seven days in which my enthusiasm for cooking was diminished by an exam, wrapping up my paperwork and responsibilities, and the process of saying goodbye to the preceptors and residents who have taught me so much in a very short period of time. 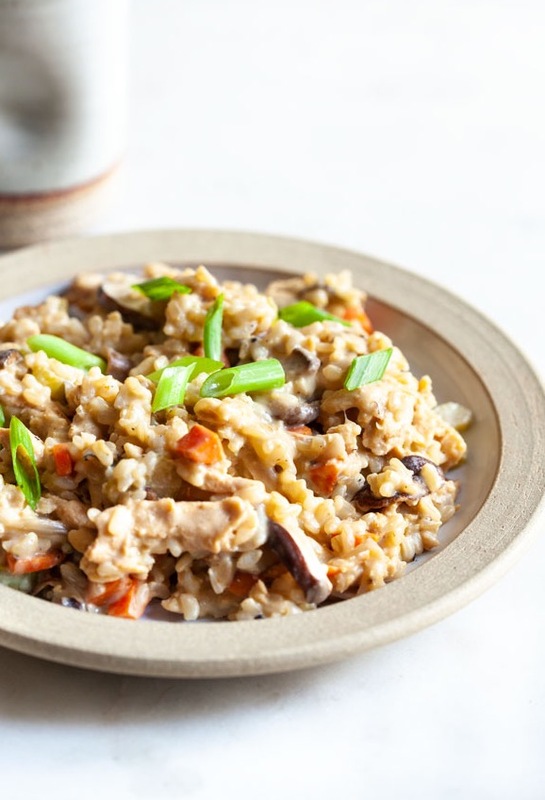 This vegan chick’n rice skillet isn’t fancy food. It’s not super creative. But it was all of the things I seem to need food to be lately: creamy, carby and comforting. (We’ll call them the three C’s.) For the first time since the DI began, my Sunday batch cooking bounty had run out before the end of the week, which meant that I needed something tasty for supper quickly, with minimal fuss, and using stuff I already had at home. In this way, too, the dish came to the rescue. The protein here is my vegan chick’n strips, which are the star ingredient of this chili and also a staple ingredient in my home. I use them for vegan chicken salad, in bowls, in breakfast tostadas, soups…the list goes on. Soy curls are such a winning ingredient: simple (one ingredient: whole soy beans), nutritious, protein dense, easy to prepare, and a lot less expensive than some of the vegan meats on the market these days. I order them online in packs of three, which affords me a ton of hearty and filling meals. The other big component of this dish is of course the rice. I used frozen, pre-cooked brown rice when I made this—I know it’s not much to cook rice, but I find the frozen bags to be super handy for those moments when one finds oneself in need of a cooked grain, STAT. I get them at Whole Foods, but I know that more and more brands are making them now, either frozen or in plastic pouches. Of course, were I being a little more organized, I’d have cooked the rice myself ahead of time, which you can, too. You can also cook it far ahead of time and freeze it, or cook it right before assembling everything else. Ditto for the cashew cream: I tend to freeze it in 1/2-1 cup portions, which means it’s nearly always on hand. But you can make it in advance, or just swap it for a plant milk of choice (the creamier and richer the better). Other things I love about this supper: umami from the mushrooms. A splash of white wine (optional) if you’re feeling kind of fancy. And the fact that it reminds me quite a bit of a chicken casserole that my mom used to make with Campbell’s mushroom soup. Times have changed a lot, but much of the food that feeds my soul hasn’t. Here’s the recipe. Heat the oil in a large skillet over medium heat. When the oil is shimmering, add the shallots, carrot, celery, and mushrooms. Sautée the vegetables for 7-10 minutes, stirring often, until the mushrooms have released their juices and the carrots are tender. Add the garlic and cook for another minute or so, stirring constantly. If you’re using the wine, add it to the skillet and continue sautéing the vegetables until the wine has mostly cooked off (about 2-3 more minutes). Add the rice, soy curls, broth, cashew cream, lemon, and salt and pepper to taste (I added about ½ teaspoon salt) to the pot. Continue to cook until everything is creamy and warmed through and the liquid has reduced. If the mixture gets too dry, add an extra splash of broth. Taste and adjust salt/pepper/lemon as needed. Serve with vegan parmesan or walnut herb parm, and enjoy! I’m glad that I’ve been so organized and diligent about preparing food in advance of these busy DI weeks, but it’s also nice to be reminded that a supremely cozy, tasty supper is possible even at the end of a long week. If you try this humble and homey meal, I hope it’ll stick to your ribs as it stuck to mine. And I’ll see you soon, for the weekend roundup.